At Collisiontec, our Mission is to provide top-quality collision repairs that are performed by a team of experienced and well-focused professionals while ensuring customers enjoy a hassle-free claims process. It is our promise to return your vehicle to pre-accident condition. It is our goal to restore your confidence in your vehicle as well and to constantly improve the quality of our services and business structure through continuing learning and keeping abreast of the latest technology available. “Please tell everyone who had a hand in fixing the truck that its the best work I’ve ever seen. And I’ve seen a million repair jobs in 30 years of this work, some of them were my own cars. You and you people are the best and will continue to get every referral. All I can say is that Dan Cooley and his professional staff are the best. I took my Porsche in last week after I was side swiped by a trailer. The work was excellent and I had my car back in record time. Even though this was a relatively small job, they handled all the insurance paperwork and did a great detail on the car to boot. Thanks for exceeding my expectations. What service. It started with a call to see if they could fix my Aston Martin. That was with Danielle. She was awesome. Then on to Janet who is a true professional. Dan one of the co-owners was outstanding as well. Regarding repairing my car, honestly I would never take my car to any other business. I am 100% satisfied with the QUALITY service. You’ve been to the rest, now go to the best. Don’t waste your time anywhere else. The Aston looks unreal. This is a car you don’t just take to any body repair shop. Not only repaired, but washed and ready to hit the road. Jeff O’dell – Via The B.B.B. 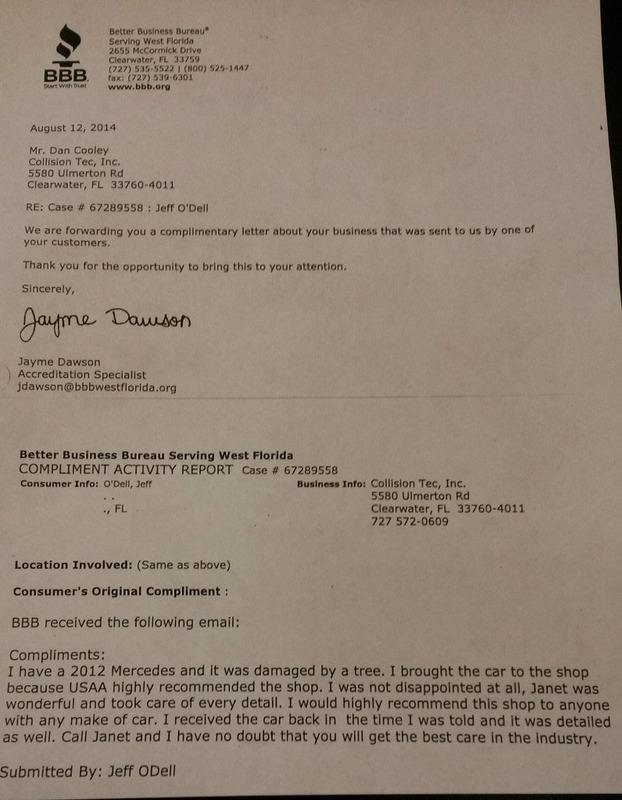 “I have a 2012 Mercedes and it was damaged by a tree. I brought the car to the shop because USAA highly recommended the shop. I was not disappointed at all, Janet was wonderful and took care of every detail. I would highly recommend this shop to anyone with any make of car. I received the car back in the time I was told and it was detailed as well. Call Janet and I have no doubt you will get the best care in the industry”. Got my car back (2013 Equinox) yesterday, Tuesday Feb. 17, and just had to say something to somebody. This has been (unfortunately) my 4th trip to see y’all (all but one, it was the other guy’s fault). I am no longer amazed at the results of the work that I see from Collisiontec, rather, I am disappointed when I see the work done on someone else’s car that just can’t match up to the quality I get with you guys. I have been spoiled by Janet and all the people that make up her team. High quality work, excellent service, and an office manager that refuses to compromise on the materials and workmanship of the repairs that come into her shop demonstrates to me why Collisiontec continues grow and has become the benchmark of the industry in and around the Clearwater area. Thanks again for taking great care of my vehicle (y’all even shiny’ed up the wheels), and as always, I hope I never have to see you again (but if I do, it will be a pleasure).